I had attended the leadership Summit conference a while back but i did find lot of correlation between that Summit and the contents covered in the lectures of “Team building and Conflict Management”. This Summit had the higher management people from various organizations as speakers and panel members and was a good learning experience. I had drafted my notes and learnings from this Summit at the location below. Please read on if you find it relevant. >Hey, I admire you visiting this site. If you like the content present in this blog, i have a question for you ? The handwriting analysis of which celebrity would you like to see featured next on this blog. Your feedback and interest is very important to me. Would appreciate if you can share it via comments. – Brett Lee is a fast bowler in Australian Cricket team. – He was one of the fastest bowlers in the World Cricket. Lee’s fastest recorded delivery to date is 161.8 km/h (100.5 mph) which he bowled in a test match against West Indies. – He has been a successful bowler for Australia in all forms of the Game- Tests, ODIs and T20. – Lee’s 161.8 km/h ball is the fastest recorded ball to date but was debunked right after an hour as three radar guns were not properly aligned and the back-up radar gun recorded the speed in 150s only. – Lee is part of the rock band Six & Out. The band is made up of his brother Shane and former New South Wales cricketers Brad McNamara, Gavin Robertson and Richard Chee Quee. Lee plays the bass guitar or acoustic guitar for the band. I had never seen Brett Lee’s autograph before i bumped into Castrol Cricket blog by the man himself. This blog can be accessed from here . This actually a video blog and the autograph appeared in the Preview of the video. I almost felt excited to dissect the autograph and know the man beneath. As with all the Signature samples available on the Internet, there is no way to determine the pressure of Signature. And also, since his exact Handwriting sample is not available, it deprives the person analyzing the signature for some valuable information. But i chose to go with what was available and Signature do give a lot of insights into the Public profile of an individual. 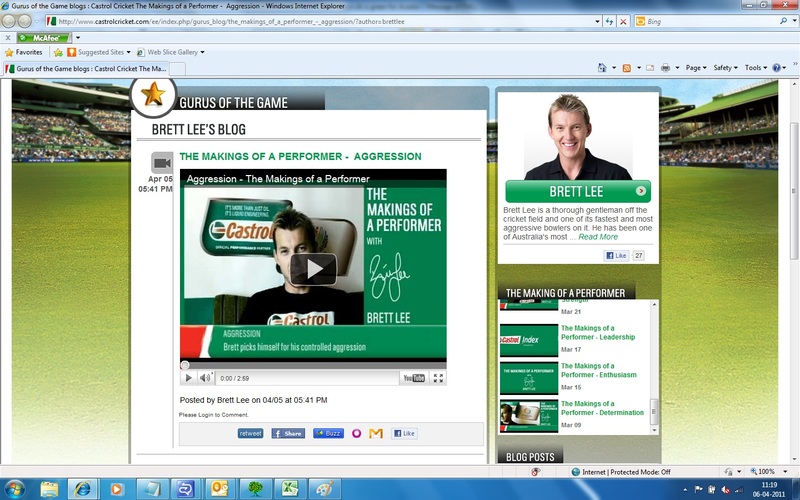 Read on to know more about Brett Lee. He possesses the need to be Socially prominent , someone who is of big stature. He has a need to stand out from the crowd. He has a great deal of Self pride and this trait is something that is a fodder for people who are extremely passionate. This trait comes naturally to a successful Sportsman, who is always in limelight. Cricket is a sport with mass appeal atleast in the countries where it is popular. Brett Lee is definitely one of the most charismatic names in Cricket. The very notion of being Socially prominent goes hand-in-hand with being in limelight. Off-field too, Lee has been a part of Advertisement and he even has is own fashion label BL . Brett is quite Frank and Open minded while communicating and giving opinions in general. If someone asks such person a Frank question, he/she will receive a Frank answer. Partly because of this aspect of his personality (apart of his Cricketing ability, of course), he is quite a popular personality. Brett exhibits a special trait called as Desire for responsibility . A person with this trait yearns for responsibility and feels restless when given less than they can handle. He always likes to handle that extra responsibility and this aspect of personality goes a long way in making him an Integral part of the team. 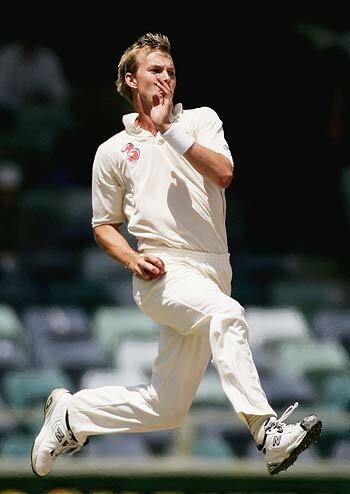 He handled the Australian pace attack when the champion pacers Glenn McGrath retired. He was more successful spearheading the bowling attack for Australia. Desire for responsibility is a true Leadership trait as what distinguishes a true leader is how much they are willing to own the circumstances and go beyond it. Brett is a Dreamer . Dreamers are often thought of as a people who can think of Impossible goals. They are risk takers. Its one thing to have High goals in life but entirely a different thing to have dreams. It is this aspect of his personality that has seen him reach and perform consistently at the highest level in Cricket. His dreams are beyond Cricket as is evident from his involvement in singing and movies. During the 2006 ICC Champions Trophy in India, Lee recorded a duet with India’s music diva Asha Bhosle called You’re the One For Me. The song reached a peak position of number two on the Indian and South African charts. In 2008, he filmed scenes for his first Bollywood movie Victory.He once hosted a short-lived TV program called “Personal Best”. Brett exhibits Fluidity of thoughts in his personality. The people with this trait are naturally great speakers and writers. The prime aspect with this trait is that the thoughts flows naturally without any internal distractions. Its because of this trait Lee has been a good conversationalist and is often writing columns for newspapers and blogs (Castrol). Brett possesses good deal of Determination in his personality. Determination is certanily one of the essential ingredients of a Successful person. this trait coupled with Desire for Responsibility has worked wonders for Brett. He has made many comebacks to the National side either due to injury or due to bad form. This man never gave up without a fight. His most recent comeback was in Australia’s World cup 2011 side. I can never forget a sight when he was hit badly on the eyebrow while fielding in Quarter-Final vs India. He was bleeding all over and it almost felt that he is gone for the match. But die to his determination, he came back in next few overs and was bowling superfast at 145 + speed. This story has more on Lee’s famed comebacks despite career threatning injuries. Brett is a Positive Thinker . He is always inclined to see the positive side of any situation. That is probably the reason that he always tends to have a Smile on his face no matter how tough the situation might be. Positive thinking along with Determination is a true asset that helps him surpass insurmountable obstacles. – Cem Kaner is one of the highly respected personalities in the Software Engineering fraternity espacially Software Testing. – Cem Kaner J.D., Ph.D., is a Professor of Software Engineering at Florida Institute of Technology. – He has authored many books on Software Engineering including the Best Sellers Testing Computer Software , Lesson Learned in Software Testing and have to his credit numerous publications on Software Testing and broader Software Engineering topics. – In 2004 he cofounded the non-profit Association for Software Testing (AST), where he serves as the Vice-President for Publications. AST is credited with arguably the best courses available on Software Testing and many a Software testers have got the necessary boost to their careers with that education. I first saw this Signature Sample in this document created by Ajay Balamurugadas . There was a Screen shot of a Certificate stating that Ajay Balamurugadas has completed the Black Box Software Testing Bug Advocacy Course. One of the Signatories of this Certificate was Cem Kaner. Since this Screen Shot was a bit small sized, i requested to Ajay to send the Original scanned copy, which he graciously did. Most of the Scanned Signatures have some disadvantages primary of which is that it is not possible to judge the Handwriting pressure. Pressure is an important indicator of emotional intensity, which inadvertently affect every other human personality trait. Other than this, the Signature is best analyzed if there is a corresponding Handwriting Sample available. 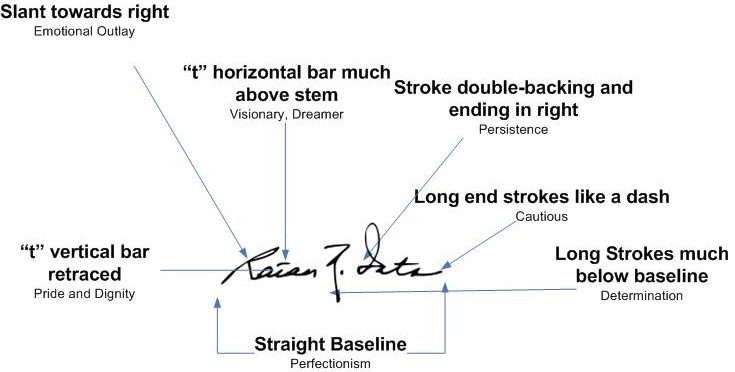 There are some important Personality traits that get revealed via positioning/Slant/Size of Signature w.r.t to Handwriting and much more. So i had to do the analysis without this Information at hand. Finally, Signature of a person is synonymous to one’s public life. It reveals the characteristics of the personality that we tend to portray to the external world, which is necessarily not similar to what we are at the core of our personality and usually is a more polished way to represent ourselves (depending on the context). Having said this, the below analysis is my honest attempt to arrive at the personality information about a person whose work i admire a lot. Someone who is a role model. 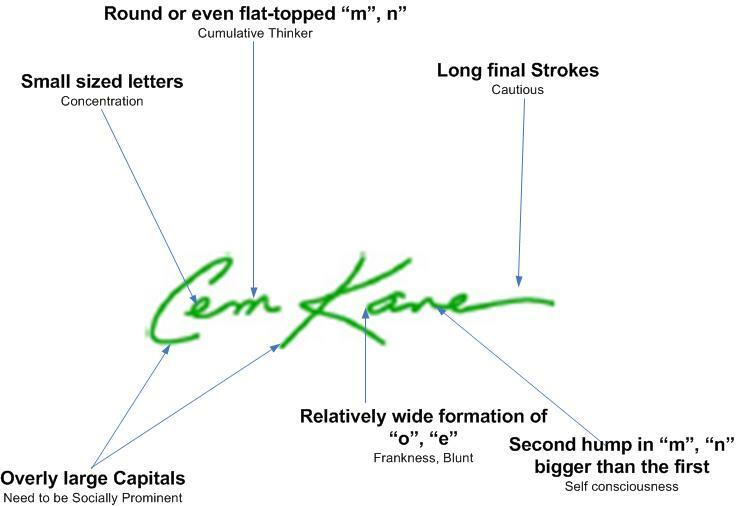 Cem is a Cumulative Thinker . Cumulative Thinkers thinks or creates much like a mason, stacking fact over fact. In this thinking pattern, the conclusion, is usually not complete until the last fact is in place. Such a thinker prefers to learn more through demonstration, by preferring to experience something rather than simply following any written or verbal instruction. This may take longer to learn but something once learned is retained for a long, long time. These are all the signs of a methodical thinker, who can build things and come up with the new ideas based on previously learned material. He has Very High Concentration levels. People with high concentration have this ability to eliminate all outside noises, thoughts, interferences, and the ability to concentrate fully on one subject. He has this tremendous ability to focus on something he sets his mind on. Cem generally Likes to have all the facts before coming up with a decision . There are people who make take decisions just on the surface level information, Cem is not one of them. He is usually quite Cautious in his approach . A Cautious person is inclined to be careful in order to minimize risk and reduce any impulsive behavior. Cem has Self Consciousness trait in his personality. Such people usually do not like to be center of attention e.g. When such a person enters a gathering full of people, he may prefer to go to sidelines until he has everyone catalogued in his mind, probably may not initiate a conversation till a certain comfort level is reached. Cem is quite Frank , Honest and Open minded while communicating and giving opinions in general. If someone asks such person a Frank question, he/she will receive a Frank answer. He possesses the need to be Socially prominent , someone who is of big stature. He has a need to stand out from the crowd. He has a great deal of Self pride and this trait is something that is a fodder for people who are extremely passionate. >If you didn’t quite get the title of the presentation, do watch this video. – Steven Anthony “Steve” Ballmer (born March 24, 1956) has been the chief executive officer of Microsoft Corporation since January 2000. – Ballmer joined Microsoft on June 11, 1980, and became Microsoft’s 30th employee, the first business manager hired by Gates. – As of 2010[update], he is one of the richest people in the world with a personal wealth estimated at US$13.1 billion. In 1980, he dropped out of the Stanford University Graduate School of Business to join Microsoft. I got this sample from one of my friends who had worked in Microsoft for a long time. He had received one Achievement trophy, which had this Signature. This is Picture of the signature. In such a sample which is ingrained in the trophy some of the aspects of the signature becomes unclear. One of such things is Pressure, which i cannot comment on. Other minute things related to the size of letters, formation may get little misformed because someone else actually does the job of rendering the Signature onto the Physical Trophy. So in this write-up, i would keep things rather simple and comment only on the trait that is a more certainly interpreted. 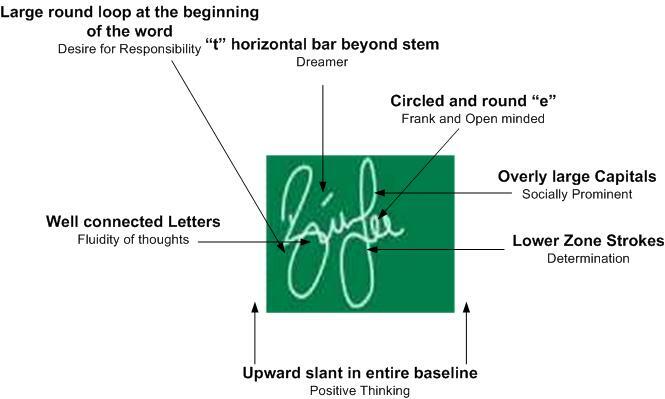 What’s in Steve Ballmer’s Signature that explains what you saw in the video ? One of the prominent things in the video is the raw energy exhibited by Steve Ballmer. There is one trait in his Signature that explains to some extent the source of this raw energy. This trait is called Enthusiasm and it really stands out in his Signature. thefreeDictionary.com defines Enthusiasm as “Great excitement for or interest in a subject or cause. It is a source or cause of great excitement or interest.” Enthusiasm is great eagerness to be involved in a particular activity which you like and enjoy or which you think is important. Real Enthusiasm is contagious, it rubs off on everyone it touches. If you are a Speaker, Enthusiasm is one trait that goes a long way in positively influencing the audience. This is what happens when Steve Ballmer addresses huge gatherings. People find his act funny and full of energy and are mostly likely to stay glued to what he has to convey. His Enthusiastic act plays as an Ice Breaker and establishes some sort of connect with the audience. Enthusiasm is one of the Key Success traits. It is the enduring emotion of excitement. 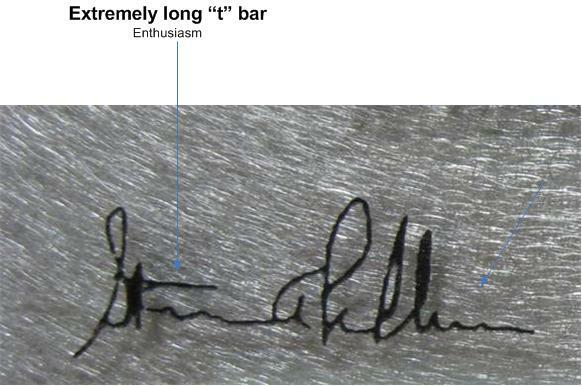 Enthusiasm in handwriting is revealed by a Extremely long horizontal “t” bar in relation to the rest of the handwriting. Wishing you a Happy Enthusiastic New Year!